Place whole potatoes (do not poke) into microwave-safe dish. Cover dish. (If covering dish with plastic wrap, poke small hole in plastic). Microwave on high for 10 to 12 minutes depending on the strength of your microwave. Use oven mitts to remove dish from microwave; carefully remove cover from dish due to steam build-up and let cool. 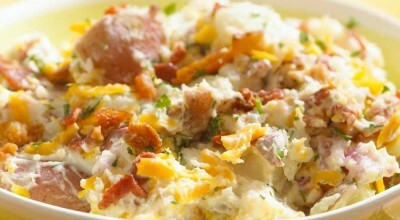 Cut potatoes in half and place in a large bowl with remaining ingredients; stir well to mix. This salad may be served right away, but is best if refrigerated for at least one hour to allow flavors to blend.